Thursday marked the final day of the Northern Irish part of the honeymoon. Having visited all of the lighthouses we possibly could, we decided to spend the day in and around Belfast to see a bit of culture there. We started off on a bus tour with Allen’s Belfast Bus Tours after a bit of a tiff between the Allen’s representative and someone from the City Sightseeing company who told us that we’d ‘bought the wrong tickets’. In the end I was pleased we’d gone with Allen’s as there were a lot less people on board so no chance of heads in the way of our pictures. On the tour we passed the city hall, and a number of churches and cathedrals. 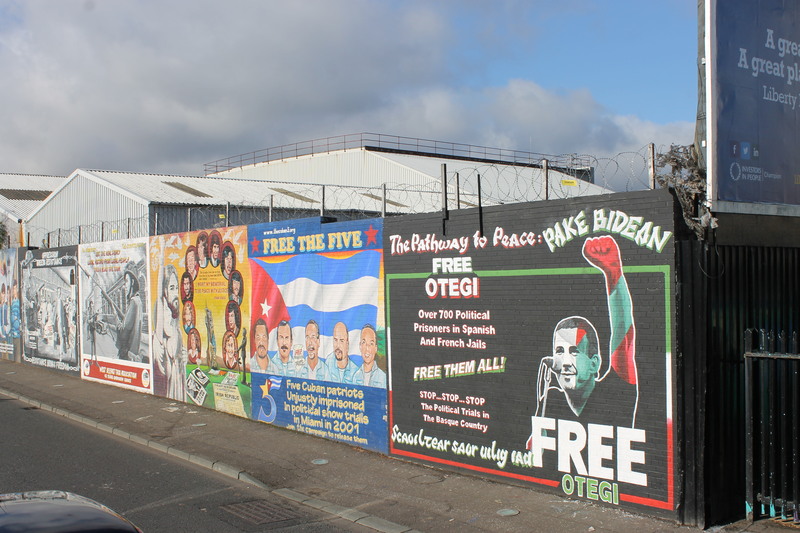 Most importantly though we were able to see a huge number of the city’s political murals in West Belfast as well as the peace walls that were constructed in the 1960s to reduce violence between Catholic and Protestant communities. We hopped of the bus half way through as we’d already seen some of east Belfast. I was quite keen to visit the Ulster Folk Museum and we made it just in time to have a while there. We ended up spending a bit longer there than we had planned. The museum is fascinating. There are a number of buildings set up and all kitted out to look like homes, shops, police stations, banks and doctors surgeries from the last 100 years. They had real people dressed up in the relevant costumes and even a lady showing us how they used to weave on a loom. It was fascinating! The best bit by far though had to be the photography studio there. 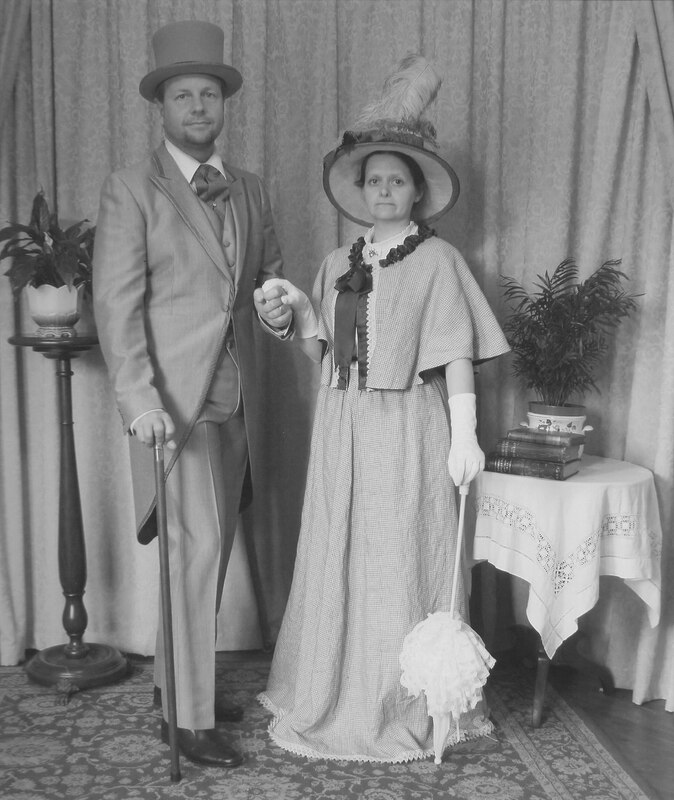 We just happened to wander in and then within about 15 minutes we were upstairs choosing which Victorian clothes we wanted to wear for our photo shoot! Harry, who runs the studio, took us through the whole process as it would have happened in Victorian times. He posed us and made us stand still for about 20 seconds like they would have had to do while a photo was taken – it wasn’t easy! Once we’d finished playing around with the costumes and I’d prised the hat off of Bob’s head we drove back to Black Head lighthouse for the night and had a bit more of a look around the lighthouse grounds than we’d managed to beforehand. The following morning we set off to catch our ferry back to mainland UK. 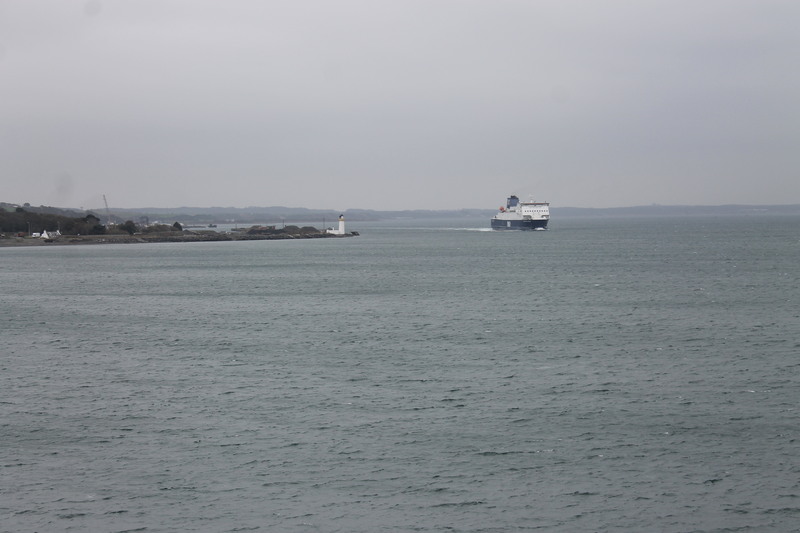 This time we caught the three-hour trip across to Cairnryan. As soon as we got on the boat we headed to the top floor where Bob treated us both to a massage, which was brilliant and completely unexpected! We had a spot of lunch and sat near the window just in time to see the lighthouse at Corsewall Point come into view. 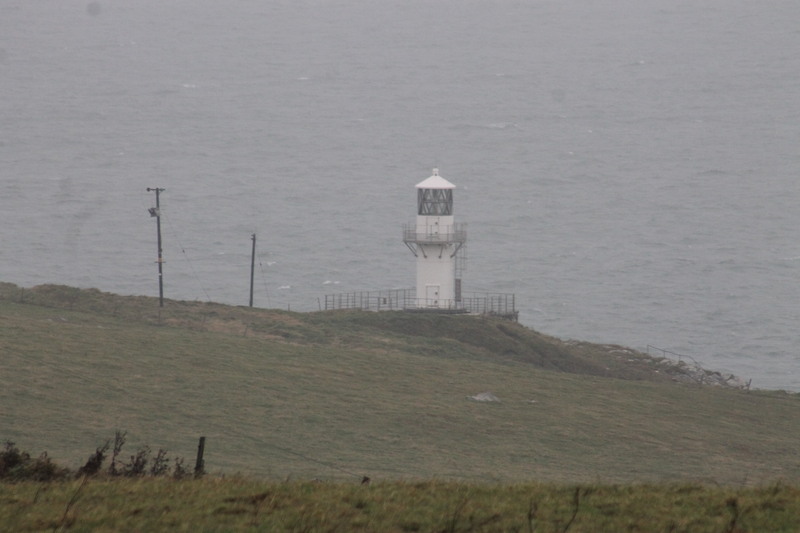 We braved the elements (it wasn’t such a nice day) and took some pictures from afar and a short while later I was saying goodbye to the lighthouse (as I always do)! That was when it was revealed to me that Corsewall Lighthouse Hotel would be our home for the next two nights. I was particularly excited as I’d visited the lighthouse before and seen how beautiful the hotel looked. Once we’d reached Cairnryan and spotted the lighthouse there we headed for Stranraer and took a quick trip to Portpatrick. The lighthouse at Portpatrick doesn’t currently show up on the OS mapping so I wanted to prove to Bob (not that he took much convincing) that there was one there – albeit no longer in operation. Our next destination was Crammag Head. After driving around some narrow roads with lots of water on them (the weather didn’t improve that day) and following a cow (we named her Daisy) for quite some distance, we finally spotted the lighthouse. There were some buildings nearby, but we were concerned about parking there and the weather didn’t entice us any closer to the lighthouse, so we opted for just seeing it from the road. 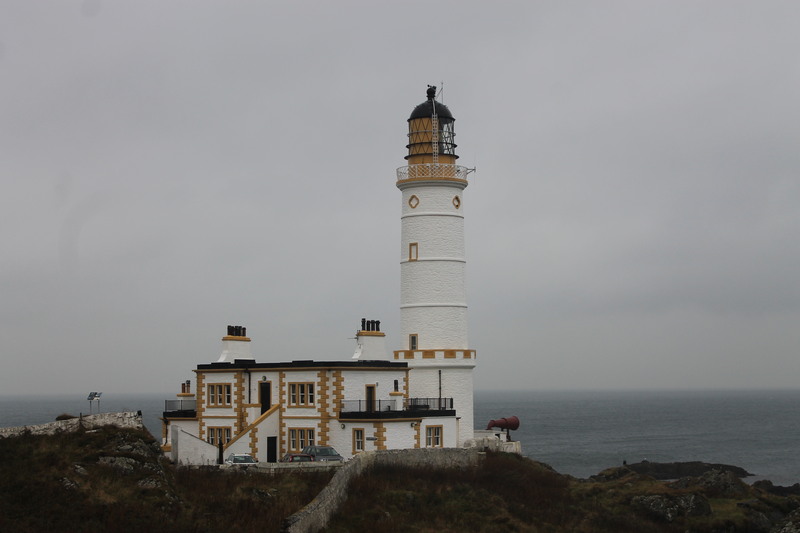 We arrived at Corsewall Lighthouse Hotel in the early evening and were handed the key to the Stevenson Suite (named after the famous Stevenson family who built so many of Scotland’s wonderful lighthouses). Before we even got inside the suite I was amazed at how big it was. Once we were inside and I’d found the beautiful bunch of flowers, the champagne, chocolates and the lovely card from Bob I was speechless. Combined with the amazement I felt at seeing how big the place was, I think Bob got more peace than he’d ever had before or is likely to have in the near future. I was stunned! I quickly angled the brilliant reclining chairs so we could see out of the large window facing the lighthouse. While I was still recovering from the shock of staying in such an amazing place, we made our way to the hotel for our five-course dinner and wine. Amazing food and in such a wonderful location!